You want to get married in Hawaii, but where to start? The islands of Oahu, Maui, Kauai, Big Island, and Lana'i offer couples a wealth of stunning wedding locales: sunny beachfront resorts, secluded private estates, scenic settings and even remote spots perfect for adventurous duos. Here's a three-step guide to finding your dream wedding location. Yes, all of Hawaii's islands make a beautiful setting for a wedding, but each offers a different mix of accessibility, ambiance, and activities. Home to the international airport at Honolulu, this gateway Isle is the most convenient with dozens of daily flights from the mainland and easy access to resorts. A wedding here offers a vibrant urban setting (a minus if you're seeking a more serene ambiance), a variety of dining options and lots of activities for guests. Most resorts such as the Moana Surfrider, A Westin Resort & Spa; Sheraton Waikiki Beach Resort; and The Royal Hawaiian line Waikiki Beach, most with great views of Diamond Head. A few resorts, such as The Kahala Hotel & Resort and Turtle Bay Resort, are located 10 minutes to one hour away and offer a less congested setting. Also offering easy access (several carriers fly direct here from the mainland and there are multiple daily flights from Oahu), geographically diverse Maui presents couples with a variety of appealing wedding settings and a wide range of activities from whale watching to wine tasting. For fabulous sunsets, you can't beat Ka'anapali Beach, home to the Sheraton Maui Resort & Spa, The Westin Maui Resort & Spa, and the Hyatt Regency Maui Resort & Spa. More luxurious Wailea is home to the Four Seasons Resort Maui at Wailea and the Fairmont Kea Lani, while manicured Kapalua boasts The Ritz-Carlton, Kapalua. Farther afield, the idyllic hamlet of Hana, famed for its black lava coast, and home to Hotel Hana-Maui is ideal for intimate vows. Known as the "Garden Isle," Kauai is Hawaii's lushest island but alas, also its rainiest. For scenic beauty—waves crashing on golden beaches with green velvet mountains (and rainbows) beyond—​Kauai's North Shore is a stunning wedding venue. It's home to The St. Regis Princeville Resort as well as private villas that can accommodate smaller weddings. For less drama but more sunshine, check out the resorts lining Poipu Beach, which includes the Grand Hyatt Kauai Resort & Spa and the Sheraton Kauai Resort. Beach weddings are popular here and activities range from sunset cruises along the famed Na Pali Coast to zip lining and hiking. Hawaii's largest and most fascinating Isle is home to both snow-capped volcanos and red-hot lava. Since it's lush and green on one side (near Hilo) and arid and lunar-like on the other (near Kona), Big Island weddings are ideal for couples who love nature-based adventure. Activities range from diving with manta rays to watching the sunset from atop slumbering volcano Mauna Kea. Most resorts are located on the sunny, lava-strewn Kona and Kohala coasts. They range from the posh Four Seasons Resort Hualalai and the Polynesian-inspired Kona Village Resort to the more budget friendly Sheraton Keauhou Bay Resort & Spa and Hilton Waikoloa Village. The lava landscape here makes for a dramatic setting, especially at sunset. Located off of Maui, this small, undeveloped isle makes an ideal wedding venue for those craving a serene yet upscale setting. Home to two resorts, the beachfront Four Seasons Resort Lana'i at Manele Bay and the forest-surrounded Four Seasons Lodge at Koele, Lana'i offers true relaxation, coupled with activities ranging from golf to four-wheel-drive adventures. Having everything—the rehearsal dinner, ceremony, and reception—at one resort is the most convenient for all involved, especially for guests. Most resorts in Hawaii have a wedding planner on staff and will work to customize the ceremony and reception, plan activities or off-property events, and arrange group discounts for guests. The average destination wedding is for about 60-75 people, but many are intimate affairs for just a few people and others are extravagant blowouts for 200. If you're thinking small, you'll have more options, such as renting a villa for the entire wedding party or getting married next to a waterfall or on a catamaran, but even larger weddings can incorporate only-in-Hawaii aspects such as a luau rehearsal dinner. Since your guests are apt to be traveling to Hawaii at their own expense, you'll want to consider their budget when choosing a location. If you do opt for an upscale property, also arrange a group rate at a resort that's nearby and more affordable. Many resorts have multiple wedding venues—the beach, a gazebo or a garden—and often schedule two or even three weddings on a single day. If you want to be the only bride at your resort on your wedding day, ask about the policy before you book. If you are traveling all those miles to Hawaii to wed, you may be thinking about doing something totally different. And you can. On the Big Island, you can get married on horseback amid the grasslands of Waimea or charter a helicopter for a ceremony on a private black-sand beach. 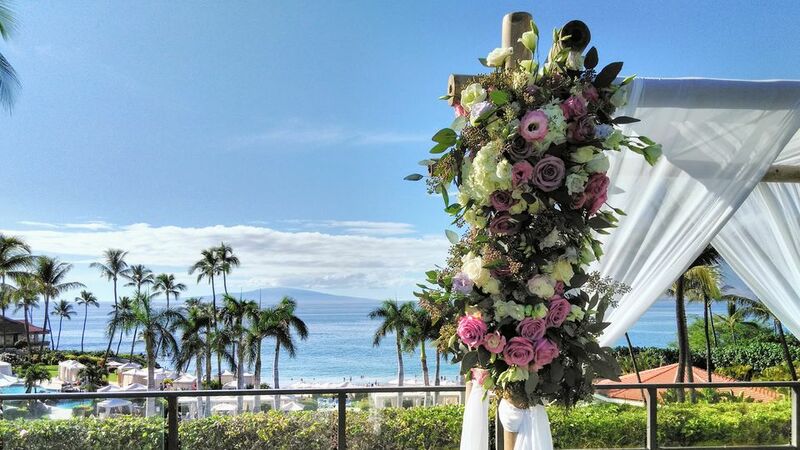 On Maui, you can wed in a gorgeous tropical garden or even underwater. And on Kauai, you can get married in a fern grotto, at the edge of a canyon or on a catamaran as you cruise the Na Pali Coast. You wouldn't buy your wedding dress without trying it on, so why would you book a wedding location without visiting it? Pack your sunscreen and schedule a four- or five-night scouting trip (consider the price part of your wedding cost) to your two top isles and check out at least 6-8 options before committing to one. Most resorts, restaurants and private villas look great in online photos, but may not live up to your expectations in real life. The last thing you want on your wedding day is to be disappointed. Where Are the Walmart Stores in Hawaii?